You are here: Home / Plumbing / How Does Home Plumbing Work? How Does Home Plumbing Work? Professional Plumber fixing clogged sink. The pros make it look easy! There’s nothing more marvelous than plumbing. Running water, a hot shower, and a toilet is luxury. But how does plumbing work? Click here and find out more. If you’ve ever been on a long camping or backpacking trip, you no doubt returned with a newfound appreciation for the miracle of modern plumbing. But it’s not magic – and anyone can learn the basics of home plumbing. In this guide, we’ll answer that question in terms anyone can understand. Keep reading to learn what you need to know about home plumbing! Your home’s plumbing system is made of a network of pipes. It includes drain pipes, vent pipes, water supply pipes, and other kinds of pipes. When you understand a little bit about your plumbing system, you can more quickly address problems. You’ll know what you might be able to do it yourself, and when it’s time to call a plumber. And when they come, you can help correctly point them to the issue that needs to be resolved. A plumbing system essentially has to get water to all the fixtures, faucets, and appliances that use water in your home. It also has to remove waste water efficiently without getting backed up or clogged. A good plumbing system can also save you a lot of money over time. If you plan ahead when you design the system, you can put rooms like the bathroom, kitchen, and laundry room next to each other, so parts of the plumbing can be shared. The plumbing system is actually a network of a few different interconnected systems. The home gets fresh water through the water supply pipes, usually from a well or water utility. That water flows to the toilets, sinks, showers, washing machines, and other fixtures in the house. Meanwhile, the drain-waste-vent system removes the dirty water and waste to the septic tank or sewer. Finally, natural-gas plumbing doesn’t involve water at all but sends natural gas as fuel to furnaces, gas-burning stoves, water heaters, dryers, and more. Now, let’s take a closer look at the different plumbing systems to more thoroughly answer the “How does plumbing work?” question. The water supply system sends municipal water to your house from the city supply, or sometimes from a well. Once it gets to your house, that water supply branches into a network of pipes that reach appliances like the dishwasher and water heater, as well as faucets in the sinks, showers, and other areas of the house that use water. Water pipes get the water where it needs to be, along with the proper valves and fittings, and the faucets at the end of the line. The pipes and fittings are usually made of copper, galvanized iron, or plastic. Most water supply pipes are between a half-inch and four inches in diameter. Sometimes they may be even larger. This is an essential part of your home’s plumbing system. The drain-waste-vent system carries away sewage and wastewater from your home’s toilets, sinks, showers, dishwashers, washing machines, and any other places where water waste is created. This system brings that waste to the public sewer or septic tank, depending on how your home is designed. In addition to this drain-waste piping, there’s the vent system, which tends to be less well understood. The vent system ventilates gases from the sewage so that they don’t get into the house. This system also helps the drainpipes keep the correct pressure to keep working effectively. Usually, the pipes in the drain-waste-vent system are hidden from sight. This is a system that you’ll rarely think about when it’s working properly. But when something goes wrong, it can become a huge issue. One of the most typical problems with this system is a clogged drain. The best systems clog rarely, but no system is entirely clog-proof. Kitchen plumbing setups tend to be pretty simple. There are usually cold and hot water pipes that supply the faucets, and a wastewater line to take dirty water from the sink. If the kitchen has a gas range, a supply pipe will also bring natural gas to the stove. In many kitchens, there are plumbing hookups for instant hot water, a dishwasher, garbage disposal, or an ice maker, too. However, many of these lines are connected to the plumbing for the sink. Like the kitchen, the bathroom is a part of the modern house that can’t operate without plumbing. In a bathroom, plumbing is responsible for getting water to all the fixtures, as well as removing waste. Ideally, this happens efficiently, quickly, and in a way that is organized with no leaks or other issues. In the bathroom, the drain-waste-vent and water supply plumbing systems are both essential. The water supply system brings both cold and hot water to the tub, toilet, shower, and sink. A fresh water source like a well or the municipal water supply is used. The water travels through the water meter before getting to each room of the house. When that water reaches the water heater, the supply divides into two separate lines. One line brings cold water and the second line carries hot water. At the same time, the drain-waste-vent plumbing removes the wastewater from the sinks, bathtub, toilets, and other bathroom fixtures. Not far away from each of these fixtures, vent pipes are responsible for exhausting the sewer gases out through the roof. This air pressure regulation also lets the wastewater flow as it should. Need Help With Home Plumbing? In this guide, you’ve learned the basic answers to the question: “How does plumbing work?” However, just because you know the basics doesn’t mean that you’re going to become a plumbing expert overnight. Professional plumbers spend many hours learning the ins and outs of the trade so they can help you address your plumbing problems. 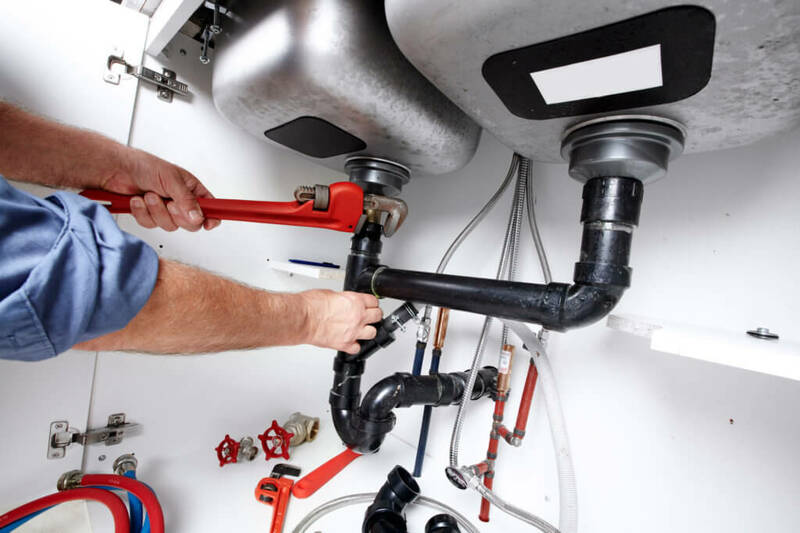 If you notice an issue with your home plumbing, don’t wait – contact the professionals to get the issue diagnosed and fixed right away.